I am working to bring you . 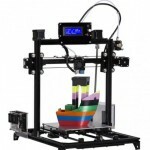 . .
You can find a knowledge base repository for 3d printing with brief introduction of 3d printing history, printing tips and techniques, brief guide for safe wiring, software tutorials, and much more.